Pure, clean water on-the-go and at home! 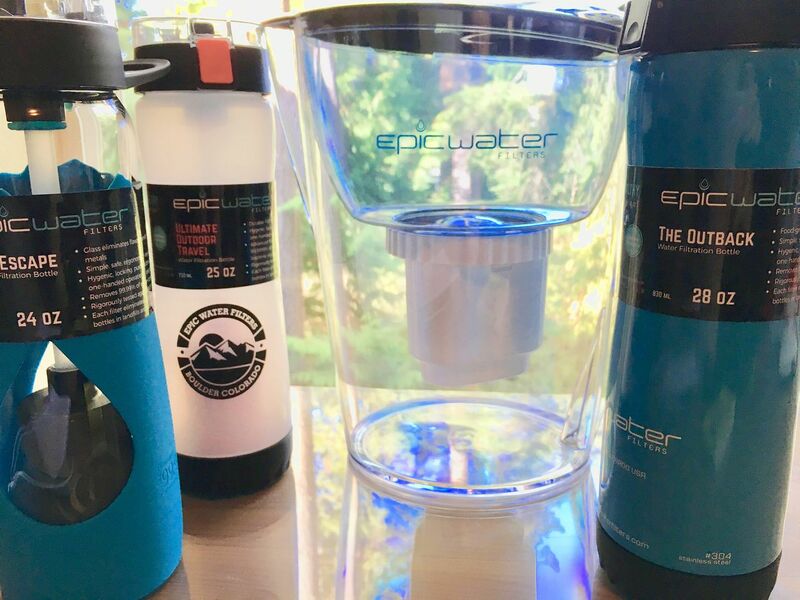 Our friends at Epic Water Filters give you better tasting, healthy water with their line of portable water bottles with built-in, replaceable filters as well as 3.5 L water jugs to keep in your fridge. Their filters are engineered to effectively reduce nasty waterborne pathogens like Giardia, E. Coli, and Cryptosporidium by up to 99.9999% and also remove harmful contaminants like chlorine, fluoride, heavy metals, industrial pollutants, agricultural runoff, and trace pharmaceuticals. Plus, if you are camping in the backcountry or traveling in countries with questionable water quality, Epic offers a sub-micron Outdoor Filter that will also remove biological pathogens like bacteria and viruses. Depending on how much you use the filters, they will last about 3-4 months or about 150 gallons, providing you with an eco-friendly alternative to single-use, bottled water. Choose from a lightweight, durable BPA-free bottle with the Ultimate Outdoor Travel, a stainless steel bottle with the Outback, a soon-to-be-available glass bottle with the Escape, a home-based Pure Water Filter Pitcher, and even a direct connect under sink home filtration system. All are made in the United States and come with a lifetime satisfaction guarantee. The bottles have convenient integrated carrying loops, caps and straws that are BPA/BPS-free and phthalate-free, and are easy to hold and drink from, keeping you hydrated, healthy, and happy. Epic performance and epic choices with Epic Water Filters!